In 2004 I had the chance to take ten weeks leave from work, my tennis ellbow from climbing was pretty bad and the idea of crossing Tibet from west to east had been on my mind for quite some time. A quick stroll through the net and the plan seemed possible. Entering China with your own vehicle is nearly impossible, the local car market is confusing for foreigners to say the least and I don´t like to be driven around in a bus from town to town. Hiking through Tibet would take a long time because distances are vast. So my trusted bike was the obvious choice of transportation. Together with my younger brother Wolfram we fly from Germany to Pakistan in August. First shock at the Airport in Islamabad, two bike bags are missing. Shaheen Airport Services takes care of us and we end in a nice hotel in Rawalpindi 10 kms (6 mi) away. In the afternoon we receive a phone call, our bags have been found in Abu Dhabi and they will be here the next day. So we have time to explore Rawalpindi, Pakistan´s old capital and book a flight to Gilgit the capital of Pakistans Northern Areas. Flights can only be booked one day in advance at the Pakistan International Airlines (PIA) desk in Rawalpindi. When we get to the airfield we realise why. A 1962 Fokker F27 is waiting for us. The old turbo prop aircraft doesn´t have modern instruments. Flying with the Fokker F27 is impossible, if clouds are in the Indus valley. All gear is stored in the back of the aircraft, our bike boxes are sitting in the first row. For excess luggage we have to pay only 5,- US $. Except for the clattering engines the flight is smooth. The Fokker has to fly around Nanga Parbat (8126 meters/26660 ft) and the views are amazing. From such a small aircraft the dimensions of this mountain are much more real. Only my brother - an engineering student - makes nervous observations about the fatigue limit of bonded and riveted aluminium. In Gilgit we stay in a small hotel with a flowered patio and put our bikes together. The following morning we hit the road, destination Kashgar in Xinjiang province in Western China. The Karakoram Highway is ideal for an easy start, the traffic above Gilgit is sparse and the villages are only a few hours apart by bike. 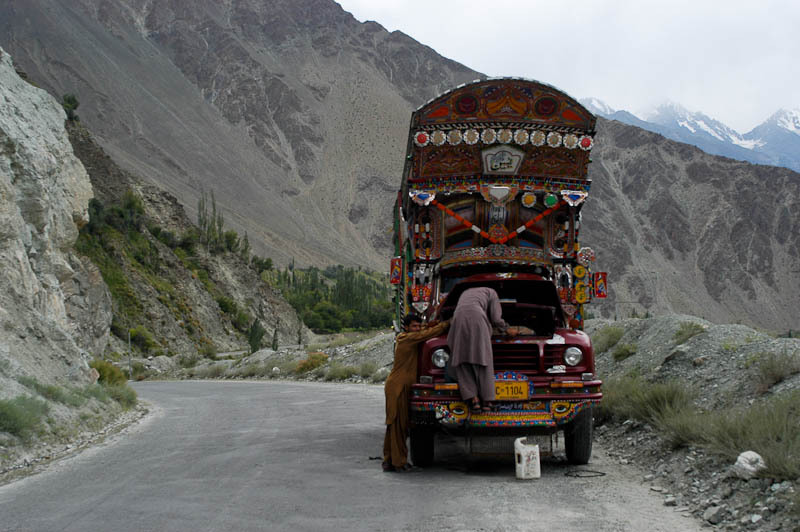 The asphalt is coarse but generally good and the road climbs over many small and bigger tributaries to the Indus. The valley tightens and the scenery is breathtaking with many ice-capped peaks and hanging glaciers, which make a stunning contrast to the dry valley floor. Without complex irrigation systems the valley would be bare of vegetation. The area is blocked from the summer monsoon rainfalls by the Nanga Parbat mountains. The locals are friendly and we find food in every village. In Karimabad we meet Benni, who is just coming back from Tibet. He started in Kunming (south-west China) three months ago and has just cycled our route in the opposite direction with a trailer behind his bike. His informations about route and checkpoints are invaluable. After three days we arrive in Sost. Here is the Pakistan border post, 30 kms (19 mi) before the border on the Kunjerab pass (4730m/15518 ft). We have to take the bus, because Chinese authorities do not allow individuals to enter China this way without a liasion-officer. He gets onto the bus 5 kms (3 mi) after the pass. 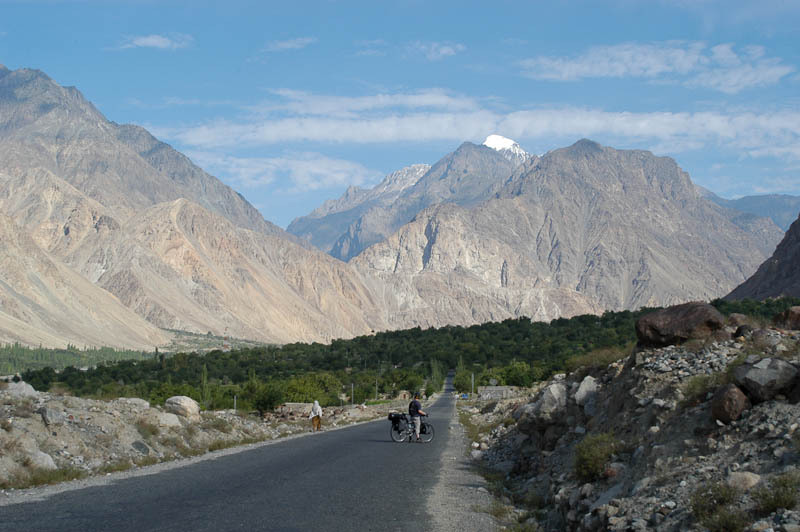 From here it´s 135 kms (80 mi) to Tashkurgan, where we get a quick health check and our passports stamped.